Song of the Deep, a small fifteen-person project at Insomniac, is also the most earnest and sincere game the studio's made in years. I’m impressed by Insomniac’s range. Twenty-two years of game development sees most independent studios either crumble or succumb to the inevitable pigeon-holing that goes on in this industry. Insomniac? Well, you’ve got Ratchet and Clank and Sunset Overdrive and Resistance and Edge of Nowhere—games I wouldn’t necessarily expect out of the same publisher, let alone a single studio. 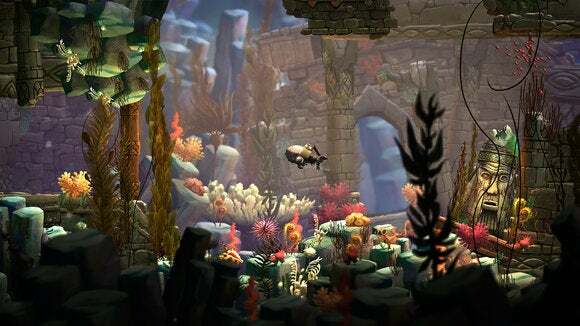 Even saying all that, I never would’ve guessed Insomniac would create a game like Song of the Deep, an interesting, indie-esque project crafted by a team of just 15 people. 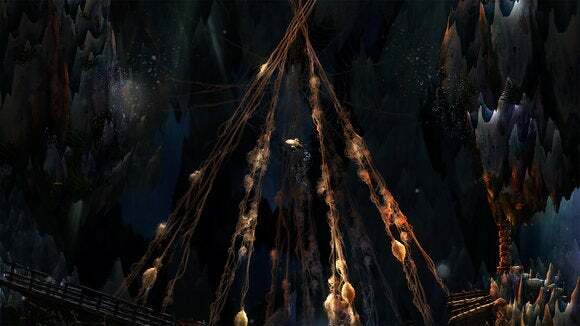 Built with funding and help from GameStop (another weird piece of this story), Song of the Deep is a 2D Metroidvania-style game about a twelve-year-old girl named Merryn. When her father’s fishing boat disappears, Merryn cobbles together a crude submarine and heads into the ocean’s depths to find him. I should specify she thinks her father’s been trapped under the sea. Alive. She’s not just plumbing the ocean floor looking for his corpse. That would be a much different game. Anyway, she heads into the ocean in her ramshackle submarine and soon discovers all her ol’ da’s sailor stories were true. Ancient ruins litter the ocean floor, beckoning her to explore. And the ocean, ever a haven for nightmares and strange creatures, is none-too-happy about her presence. Anglerfish try to eat her. Jellyfish try to sting her. Urchins (the sea variety, not orphans) try to shoot her. Oh, barracuda. Merryn’s saving grace is that she’s also, at twelve years old, a prodigious weaponsmith in addition to her understanding of pressurized engineering. Sonar pulses, torpedoes, and a big claw all help Merryn chart her sub through unfriendly waters. 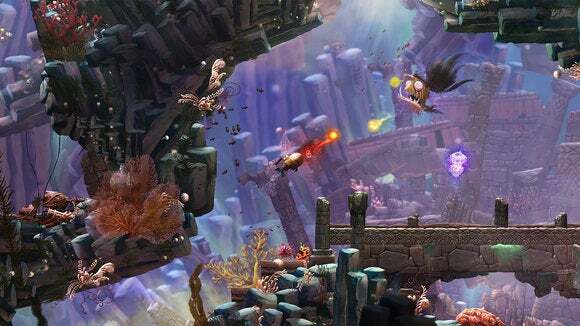 It’s here, in combat, that Song of the Deep feels most like a “Classic Insomniac Game.” Weapons aren’t as crazy as Insomniac’s usual output—no gun-that-turns-enemies-into-chickens here—but they interact in creative ways. Take torpedoes, the most generic of submarine weapons. While they can be targeted at enemies, you can also snag one with your claw after firing. This sets both claw and torpedo spinning around Merryn’s sub at high velocity, creating a combination wrecking ball/shield. It’s an unexpected bit of silliness in Song of the Deep, a reminder that “Oh yeah, this little game came out of Insomniac.” Because otherwise, it’s easy to forget. Song of the Deep is just so...earnest. Small. Introspective. 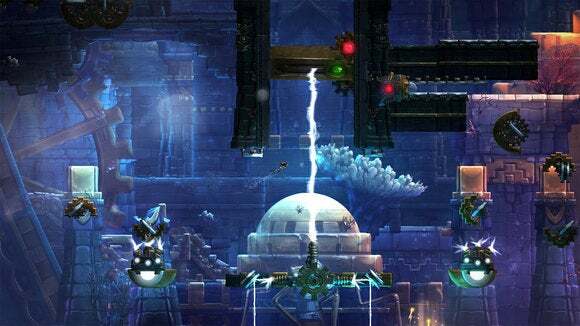 My first instinct is to compare it to 2007’s indie classic Aquaria, for obvious reasons: They’re both underwater Metroidvanias. After playing a demo build for about forty minutes though, comparisons to Aquaria feel pretty surface-level. Yeah, you’ll occasionally get out of your submarine and use Merryn to swim around and solve puzzles, but there’s nothing as weird and experimental (that I’ve seen at least) as Aquaria’s singing-based skills. Ignoring the setting, Song of the Deep has more in common with Insanely Twisted Shadow Planet. Both involve piloting a ship around (as opposed to platforming) and using its oddball arsenal to solve problems. Either way, the nearest touchstones for Song of the Deep are small indie projects, something you’d expect from a team of upstarts instead of the crew that put out the in-your-face bombast of Sunset Overdrive. And on that, it’s piqued my interest. As with Ubisoft’s similarly-experimental UbiArt projects, there’s something charming about a studio like Insomniac shirking the shackles of “Bigger is Better” and letting a team work on an obvious passion project. Does that automatically equate to quality? Not necessarily. Ubisoft’s Child of Light aped the hand-drawn indie aesthetic without really hitting on anything interesting. 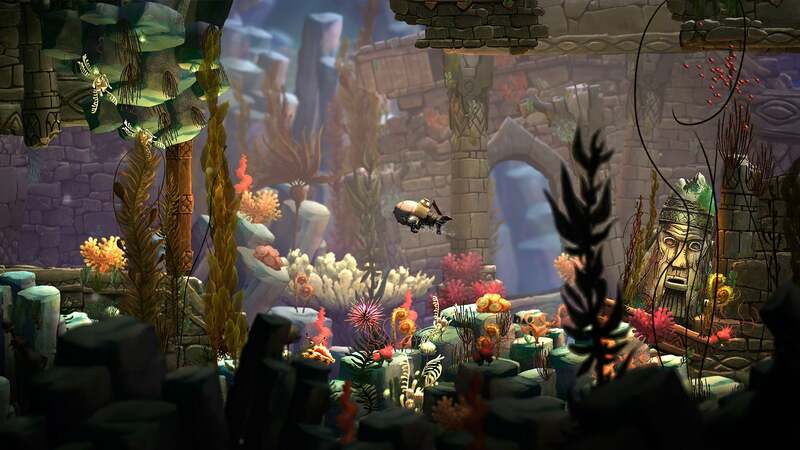 But what little I’ve played of Song of the Deep so far seems wonderfully sincere, both artistically and emotionally. Look for the full game to launch sometime this summer.